9G, Jalan 2/115A, Taman Pagar Ruyung, Off Jalan Kuchai Lama, 58200 Kuala Lumpur, Malaysia. 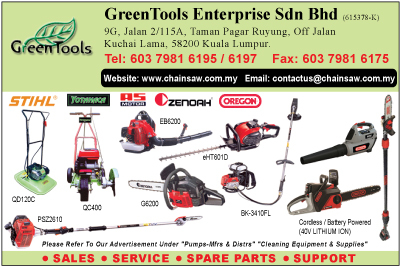 GreenTools Enterprise Sdn Bhd was incorporated in 2003 as trading in variety of power tools, agricultural equipments and also construction equipments. 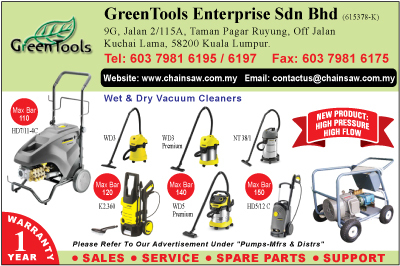 GreenTools start its sales offices at Kuchai Lama and it is fully operational now. 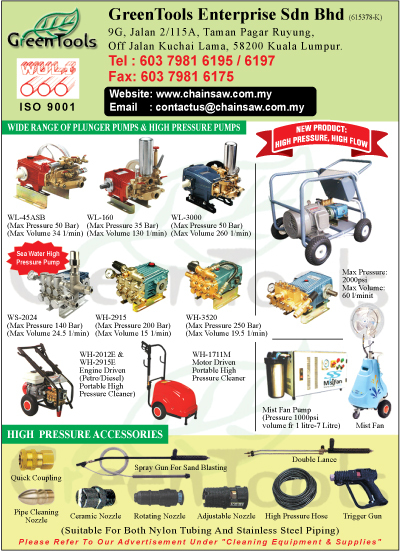 GreenTools objective is to serve our customers to full satisfaction and in order to achieve this, we maintain at all time good stock level with full range of standards of our varieties of items to ensure our customers that our sales premises offer 'One-Stop' center for Power Tools, agricultural equipments, cleaning equipment, chainsaws, construction equipment, hight pressure pumps etc; for whatever application you may have named it. In order to keep us abreast with the ever- changing business world, take a further leap by launching our official web site to serve our customer better. Here we would like to take the opportunity to show our deepest gratitude and thanks our long-term customers for their full support.